As December draws to a close, that can only mean Cusemas is upon us. So it’s time for the annual tradition of determining stocking stuffers for Syracuse football and basketball. Eric Dungey: For the third year in a row, Syracuse’s signal caller finished the season on the shelf. And for the third year in a row, here’s hoping Dungey’s stocking is loaded with health as he enters his senior season. Steve Ishmael: A decade catching NFL passes. 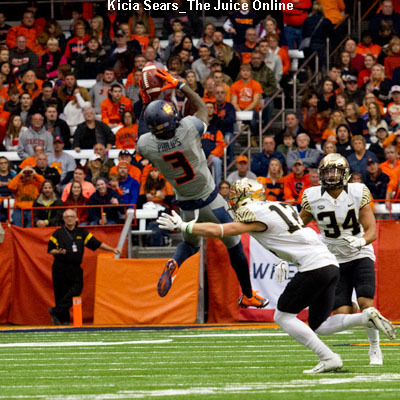 The big question entering this past season was how would Syracuse replace Amba Etta-Tawo’s production? Ishmael answered that and then some. He was pretty much unstoppable no matter who was matched up against him in coverage. A long NFL career can show potential WR recruits why they should want to play for Babers. Tyus Battle: A long NBA career. Battle has been pretty dominant through Syracuse’s first 11 games. With ACC play right around the corner, bigger venues will present bigger dragons to slay. 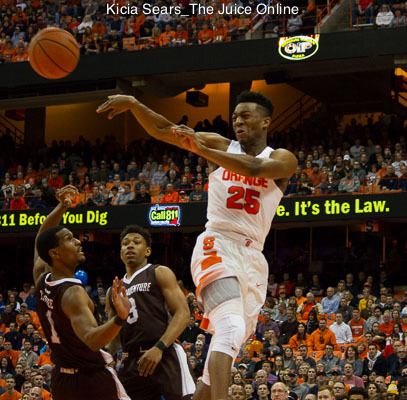 Battle should blossom into a first round selection in the upcoming NBA Draft and continue the Orange’s streak of first round selections. Frank Howard: In a word, success. Howard’s sophomore campaign probably didn’t play out as he hoped and in all honesty, no one would’ve blamed him if he transferred. But give him credit for sticking it out and turning his game around. 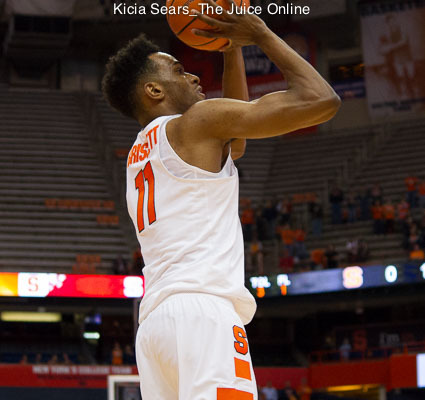 Now he’s a critical cog, along with Battle and Oshae Brissett, in determining Syracuse’s success level this year. The Fans: People, how about some patience AND a little bit of faith?!?!?! That goes for hoops and football. Let’s address basketball first. Some of you still have a sour taste left over from Quade Green and Jordan Tucker. I don’t want to touch either dead horse, so, GET OVER IT! But those misses to Kentucky and Duke, two of the bluest blue bloods there are, led to cries that Syracuse can’t recruit anymore. Hop leaving for Washington didn’t help either. Now, for the football fans. Yes, back-to-back 4-8 seasons don’t generate optimism. And when your regional rival uses total garbage OOC schedules to become bowl eligible *cough…..Boston College…..cough*, well, that’s another kick in the pants. But, read what I wrote above to Dino. The man has a plan and a system. But, he doesn’t have all the necessary tools to implement either. Seriously, give Babers and the staff time to get a fully stocked roster of THEIR guys. For example, and I can’t believe I’m about to type this, look at BC. This is Steve Adazzio’s fifth season. FIFTH! And while BC has had some atrocious years with embarrassing losses on his watch, look what happened when he was finally able to run his system with a loaded roster of HIS recruits. You haven’t forgotten what AJ Dillon did a few weeks ago in the Dome, have you? Just wait until Air DeVito is carving up defenses in a couple of seasons. Just. You. Wait. (To take place immediately after JB airs his list of grievances with the long-time Syracuse troll, that is). On behalf of all us us here at The Juice Online, thanks again for another great year. Merry Cusemas to all and to all, a good night!